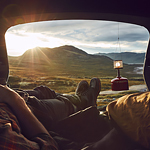 How to Take a Low-cost Road Trip | Grand Prix Motors Inc. Taking a road trip is a fun way to take a break from your usual routines and see new places. You might want to take a short trip to a favorite lake or a long cross-country drive from east to west or north to south. To make your trip more affordable, use a route planner. Consider the fuel prices, lodging and tolls for similar routes. You could also lower the cost of taking a road trip by packing light. For every 100 pounds of weight in your car, it loses about 1 percent of its fuel economy. While packing, be sure to take some healthy snacks and bottled water, and skip pricey pit stops. Find a vehicle that runs smoothly for your upcoming road trip by coming to Grand Prix Motors Inc.